What are the import procedures in Canada to move goods? How to import to Canada? Explain about import registration process, cargo movement to Canada from overseas countries, Import delivery process in Canada etc. 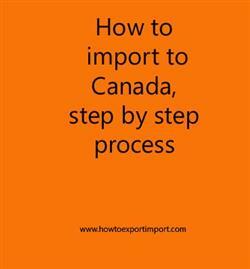 This post explains about step by step procedures that need to be finished with Canada government authority for importation to Canada. For importing/exporting commercial merchandise into Canada, you need to enroll with Canada Revenue Agency (CRA) to acquire a business number. Have a Business Number with an import-export account. Usually, import of goods to Canada requires three categories of procedures wherever required. One-time registration procedures to act as an Importer in Canada, Specific import licence to import goods to Canada if applicable, and certain certification from concerned government agencies of Canada related to each import wherever applicable. The Trade Controls and Technical Barriers Bureau are in charge of issuing permits and certificates for several items contains on the Import Controls List accordingly to the Export and Import Permits Act. The Canada Border Services Agency (CBSA) deals with monitoring inflow and outflow of goods in the country. CBSA is the federal agency that is responsible for border enforcement, immigration enforcement and customs services. This post explains about different phases in import process that every importer needs to go through in Canada. Step by step process to import to Ontario. Methods to import to Iqaluit. Guidelines to import to Vancouver. Please guide to import to Kelowna. Help to import to Canada. How to import to British Columbia Ontario? Formalities for import to VANCOUVER. Procedures to import to Quebec TORONTO. Need to import to Montreal. Explain to import to Halifax. Information to import to Hamilton. Clarifications to import to Ottawa. How can I import to Quebec City. What should I do to import to Hamilton. Procedures required to import to St. John’s. Requirements to import to Hamilton.